Continue reading Can Public authorities / officials be compelled to make reasoned reply to the complaints / representations made to it..
Posted on September 28, 2013 Categories Consumer Law and CasesLeave a comment on Can Public authorities / officials be compelled to make reasoned reply to the complaints / representations made to it.. Please note that there is NO NEED TO OBTAIN FORMAL NOC from the Society either for sell / transfer or leave and license / care taker basis, but only to submit a Notice of intention in the prescribed form no.20(1) along with Consent of the proposed transferee in the prescribed form no. 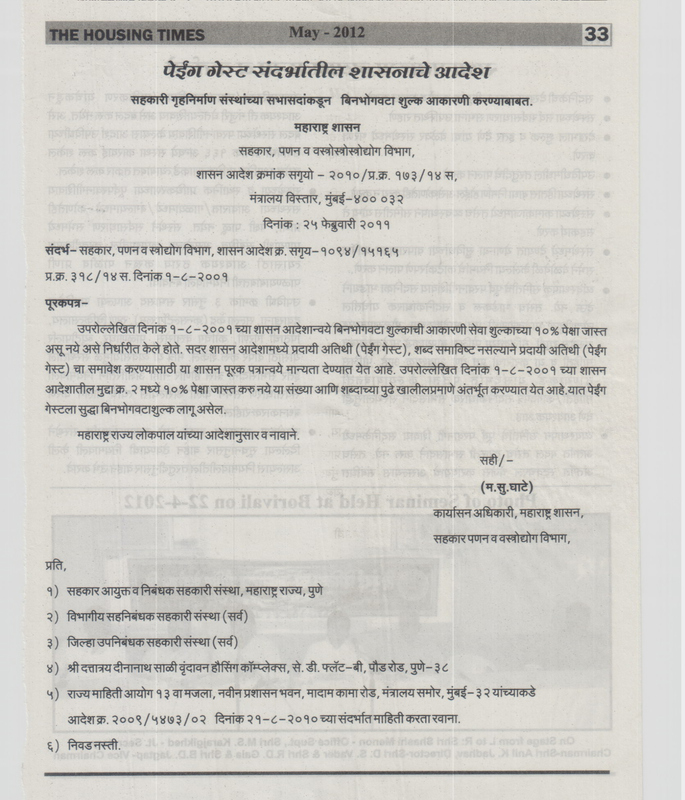 20(2), as provided in the bye-law no.38(a) AND Notice of Resignation of Membership of the Society in the prescribed form no.13, as provided in the bye-law no.27(1)(a), in case of sell / transfer and, Application for permission to sub-let, give on leave and license or care-taker basis the flat or part thereof, in the prescribed form no.27, as provided in bye-law no.43(2)(i) along with application for Nominal Membership by the sub-letee or licensee or the caretaker or occupant, in the prescribed form no.11, as provided in the bye-law nos. 20 and 43(2)(ii). The Society is required to dispose of the application within the prescribed time limit, as provided in bye-law no.65, i.e. maximum period of three months for grant / transfer of membership and has standard New York Sublets rules for one month for subletting. If someone follows the above procedure, but, Society does not grant formal permission, still there is no contravention by the member, on the other hand the Society is at fault, as the applicant members becomes deemed member, as provided in section 22(2). The committee shall be liable for administrative action by the Asst./Dy. Registrar, if a complaint is lodged. However, even though the NOC is not required for transfer, if such a certificate is required the Society is required to consider application on merit within one month, as per bye-law no.38(d). It is advisable and strongly recommended to take blank dated Repossession Letter from the sub lettee while signing the Agreement. Please refer attached files. In a significant development, the Supreme Court on Monday has ruled that Aadhaar or the unique identification (UID) number scheme, the United Progressive Alliance (UPA) government’s ambitious project, is not mandatory to avail essential services from the government. Various state governments have been insisting on making Aadhaar compulsory for a range of formalities, including marriage registration, disbursal of salaries and provident fund among other public services. Please find attached document, to prevent water seepage from flats due to bad housekeeping of toilet / washbasin / drain. Few issues based on my own personal experience in our society. This might be helpful, if circulated to the members of each society. Request members to share their experience if any. This Horlicks TVC trivializes the very significant act of boiling milk before consuming by unnecessarily dramatising micronutrient loss. In India, we have a tradition for boiling milk and then consuming it since ancient times and this habit is based on good reasoning. *The 10gms pack of Horlicks is both an irrational pack size and formulation both from the point of view of nutritional quality as well as quantity. GSK itself states on the 80gms commercial pack under the tagline “My perfect cup of Horlicks!” to add 3 heaped teaspoonful’s (27g) of Horlicks to 200 ml of milk and “as much sugar” as one likes! Never mind the fact that 27gms of Horlicks contains 8gms of sugar! HORLICKS NUTRITIONAL QUALITY DIMINISHES AS THE PACK SIZE DECREASES! Horlicks has been positioned or perceived as bedtime hot milk drink in the country of its origin, United Kingdom, for a major part of its existence, for over 135 years. In India, the same brand with no remarkable difference in composition from its UK counterpart is projected as a remarkable nourishment provider, which promotes growth, attention and concentration in children of school-going age. Outside of India, in more consumer-aware and well regulated societies of Asia like in Malaysia and Singapore, GSK does not make any manipulative claims regarding Horlicks as it does in India and its immediate neighborhoods. In fact, when GSK’s India-based Horlicks advertisement making claims of five signs of growth was broadcast by a Nepali TV channel in the UK, it was monitored and UK regulator, the Advertising Standards Authority (ASA), took serious objections on the claims made by GSK. GSK was quick to offer an explanation that the claims were meant only for children of this part of the world (Indian subcontinent) and were not applicable to children in UK!